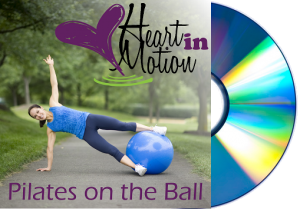 Get Your Heart In Motion with Pilates on the Ball is the most amazing and challenging core DVD on the market today! Traditional abdominal exercises only work surface muscles, often leaving you struggling to gain a truly flat midsection. Pilates targets the deeper muscles of the core, creating tighter and more toned abdominals, glutes, and back. This 45 minute Pilates on the Ball video will walk you through a challenging, multi-leveled full body workout that is a great addition to any workout routine. Try it today and make a dramatic difference in the look and feel of your core. We only ship to addresses in the United States. $18 each, includes shipping. Purchase our Pilates on the Ball DVD now for $15. A great alternative to boring workouts at the gym. I have used many web programs to help me lose weight over the years, but none of them has given me results that last. Using Heart In Motion has allowed me to lose 60 pounds so far by making simple changes every week. This program has completely changed my relationship with weight and food forever! I refer to Heart In Motion's recipes all the time for healthy variations. Who'd have ever though a chocolate smoothie with spinach would taste good. This is a great way to get a vegetable in me with a great taste! Heart In Motion has helped me lose weight in a way that's not overwhelming. Focusing on small steps makes it easier to stay on track. I am a cancer surviver. I had extensive surgery that left me quite weak. I am so grateful for this website as it has given me the challenge to exercise at my own pace. It is also teaching me new ways to eat, foods to avoid, and new foods to add to my diet so as to reduce the chances of my cancer returning. I am making changes in my eating, I am exercising as I have been taught to do through this website. For this I am very grateful! I love having the videos available when I need them. I play the stretching video on my phone after tennis matches.